Blockchain Technology has made its mark felt in almost all the different industries that exist. Be it Tourism, Banking or even Education. Blockchain is being successfully implemented everywhere. It should come as no surprise that the Real Estate market is next in line. The real Estate market is basking in the glory of an economically slumped market. With values of goods plummeting, those who deal in Real Estate are making a killing. Land that was purchased at reduced rates is now being sold on much higher premium. Speeds Up Transaction Process: Blockchain technology deletes Third-Party vendors who inertly increase costs and time to complete any transaction. Secure Online Data Storage: Storage of the vast amount of data of all the past deeds, ownerships and even the original owner’s information of a plot of land is now possible with the help of Blockchain. As Blockchains are un-tamperable, the data stays secure. Be Cost Effective While Trusted: The technology behind Blockchain shall eliminate the need for title insurance and add efficiency and confidence to transactions. 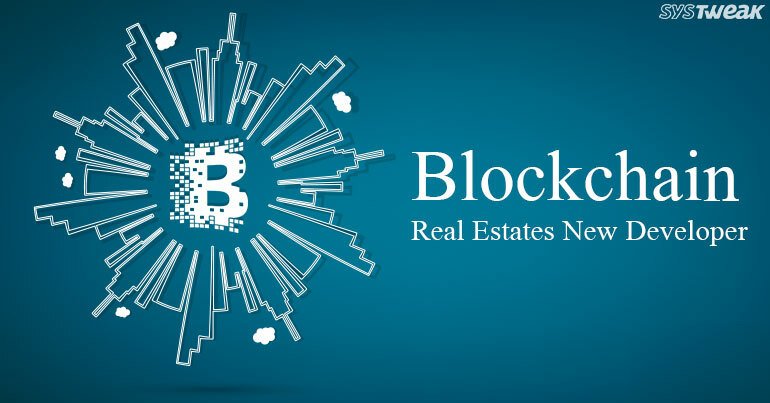 Make Good Information Available Openly: The risk involved in the transactions of land or apartment deals is diminished with the transparency of information that is made available with Blockchain Technology at the helm. Decentralization: As Blockchain Technology is a decentralized format, Information stored in the blockchain is accessible to all peers on the network making data transparent and immutable. While there are a great many motivating factors to jump onto the Blockchain Technology bandwagon, there are few trail blazers who have already done so. Swedish government sanctioned all transactions related to Real Estate to go through the process of blockchain. This was to lessen the time it took for a deal to complete and in turn helped the government to take stock and into account the ownership of all land. The digital transaction also helps in transferring the deals onto a server from where in it can help in many different sectors such as Digital Identification of its citizens and Healthcare. The Republic of Georgia, Honduras, Brazil and even Dubai in the United Arab Emirates are similarly trying to implement Blockchain technology for the benefit of their people. Amongst the pioneers in applying Blockchain technology in the real estate market, Ubitquity has set a benchmark. Offering the innovative Software-as-a-Service platform, it helps the customers to delete any need for hiring a third-party agent to hunt, locate and then show property. Working with the aim of removing centralization, Ubitquity holds data that is verifiable by the Bitcoin Blockchain. They also support Ethereum, Hyperledger, and MultiChain. The Colu stack is interoperable with UTXO based blockchains. They are focused on being the one stop shop for finance, title and mortgage companies. Though it has roots from North America, it is currently focused on Brazil and its development. These facilities once implemented can lead to the betterment of the people by the government of the land. While there may be many companies, governments or municipalities who want to adapt to the Blockchain Technology in their market, there is one reality that can’t be ignored. Blockchain technology is here to stay. Its vast options shall only make better the multiple lives it touches. For a technology to give a person the right of ownership while increasing the value of goods is a remarkable achievement. Take a bow Blockchain, you earned it!